Scooters. I am obsessed with them. I have so far owned at least sixteen human-powered scooters and three electrics. The Flykly scooter is something altogether quite new. It seems to have checked many boxes from the wish lists of the scooter fanatic community, and in doing so will have an appeal to new buyers beyond this exclusive group. Earlier this year, I was doing a lot of research into electric bicycles, and one product that really stood out in the electric bicycle world was the Flykly Smart Wheel. It is mounted in the hub of one bike wheel and is self-contained, with all the motor and power components inside, yes the battery is in there. These sell for $999 USD and come in three wheel sizes to convert almost any bicycle into a magic machine. The simple and clean design does away with cables and links from motor to battery, and from motor to control mechanisms. In a bicycle it runs in pedal assist mode, which means the rider’s physical input is assisted by the motor. You pedal, it gives you a push. You brake, it stops assisting. As soon as I saw the Flykly system I thought, that would be perfect for a scooter! And now here it is on a scooter. A scooter that has the following characteristics that seasoned scooter users all hold in high esteem. Low footboard to facilitate easier kicking. Foldability so the scooter can be picked up and carried and stowed into a small space. Sixteen inch wheels, a sweet spot between a full footbike and a portable. 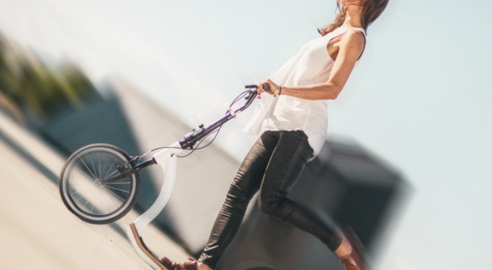 Flykly call their scooter the Smart Ped and at time of writing is available for $999 USD. Compared to other electric scooters, this is a low price. They describe the system as Kick Assist which is the non-bicycle version of pedelac. It comes with front and rear caliper brakes, an electric charger, and there is control input via their smartphone app Bitride, which has both iOS and Android versions. Imagine riding a kick scooter and having an invisible hand give you an extra push along. That is what this system offers. There is no complicated drivetrain as you would have on an e-bike, and this simplest of simple powered vehicles will help you climb the hills and get around with a perfect balance of exercise and convenience. The Flykly Smart Ped may be the best electric scooter to appear so-far. Jeffrey the Barak is a scooter fanatic who sometimes puts blue things on top of green things for no reason. I hope you post on our LetsKickScoot Forums on this subject. (I haven’t seen it yet, if you did.) This seems like a fantastic resource! I recently received my Smart Ped. It’s a blast to ride! The handle bars are placed forward and perpendicular to the scooter. It’s really easy to kick off and get a get a good assist.